This illustration is titled "Genetic Fingerprints For Cancer." 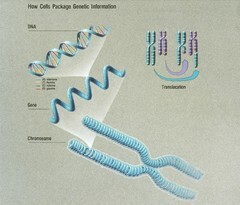 It explains the components of a chromosome and a gene. It also illustrates translocation, which causes some types of cancers. See artworks: GA-17.